This figure was included in the Cloud City Playset, but made its first appearance on The Empire Strikes Back 41 back card. 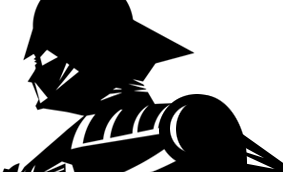 This figure also appeared on a Canadian exclusive skin wrapped card*. Comments: Much like a pair of blue jeans, the thing about the vintage Dengar action figure is that it looks better the more it's worked in. Though the same thing can?t be said about the other figures in the line ?save maybe Boba Fett-, this figure actually looks more rugged and far more film accurate. That being said, we highly recommend everyone to tear the bandage-topped bounty hunter out of his top-graded acrylic case and give him a good old stone washing. Major Variations: Though all vintage figures have minor variations, the Dengar action figure has no major variations. 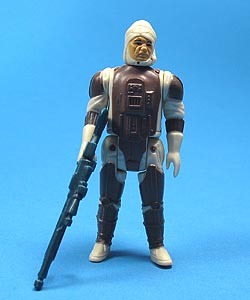 Though often considered a variation, Dengar figures with pale painted faces appears to be the result of aging. To date, there has been no conclusive evidence proving it to be otherwise. *The Canadian Skin Wrapped figures were produced for Sears Canada and were included as exclusive bonus figures in multi-packs created for the holiday catalog. Since these figures had not yet been released on card backs, Kenner produced them vacuum-sealed on lower quality cards that had every element a regular Canadian The Empire Strikes Back cards had save an actual character image or the individual colours on the name plate and behind the figure itself. The card back was completely unprinted. Though in some cases renamed from the mass released versions, the skin wrapped figures were: Dengar, Ugnaught, Lobot (Lando?s Aid), Han Solo (Cloud City Outfit), General Veers, Luke Skywalker (Hoth outfit), and R2-D2 with Periscope.